Does Losing A Job Mean Losing Your Health Care? It's a common story: You lose your job, and your health insurance goes with it. But it doesn't always have to be this way. 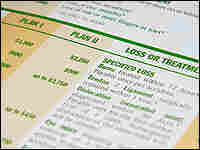 An expert offers several alternatives to prevent your medical bills from adding to your stress. Does Losing A Job Mean Losing Your Health Care? It's an increasingly common story these days — you lose your job, and your health insurance goes with it. But experts say that doesn't have to be the case. "It often doesn't end well," says Karen Pollitz, a research professor at Georgetown University and a health insurance expert. "But there are some things to know, and there may be a way to thread the needle through this." But that's not been the case so far for the Secrest family of Martinsville, Va.
Like many of his neighbors in the rural town just north of the North Carolina border, Gregory Secrest, 40, had been well-employed in the furniture manufacturing business. But last summer, after 10 years at the same job, he and his colleagues got a letter from the firm's president indicating that their jobs would be eliminated. "He told us we couldn't compete with the overseas market. So they were shutting the manufacturing facility ... and Aug. 29 would be our last day," he says. With his job went the health insurance Secrest, his wife and four of the family's five children depended on. Secrest's firm, American Furniture, offered him COBRA coverage — a requirement under federal law that allows workers in firms with 20 or more employees to continue their health insurance for up to 18 months after they lose their jobs, if they pay the full premiums themselves. But for many families after a job loss, money is tight and COBRA is expensive. It cost more than $1,500 a month for the Secrest family. To make matters worse, Secrest's wife recently lost her part-time job, too. "And with her not working and trying to keep the house, trying to keep groceries on and trying to keep the kids in school, my slush fund just dwindled," he says. "It was just too expensive." Pollitz says if you lose your job, the first thing you should do is see if there's some other way to find group health coverage. If your spouse is eligible for health benefits at his or her job, that's the first place to look, she says. "Under federal law, loss of your group health insurance benefits entitles you to a special enrollment opportunity in your spouse's employer group health plan," she says. In other words, even if it's not open season at your spouse's company, if you lose your health insurance, you have 30 days during which you and your children can join your spouse's plan if you're otherwise eligible. Pollitz says if that's not available, you should consider COBRA, despite the cost. "That group health insurance plan you had is probably the best health protection you can get," she says. Under federal law, you have 60 days to decide whether to continue your coverage under your old job, and then another 45 days to pay that first premium. It's not cheap — the typical cost for COBRA coverage is about $400 a month for an individual and $1,000 for family coverage. But Pollitz says it can be worth it, even if you have to borrow the money, particularly if you're already in the middle of an illness. "Because your coverage doesn't stop, you don't have to start a new annual deductible, you don't have to change doctors ... all your benefits are the same," she says. One money-saving tip about COBRA — each member of your family is individually eligible to continue coverage, so if only one person really needs that coverage, you can sign just him or her up and try to find cheaper coverage for everyone else. Of course if the company is going out of business, there's no health plan to continue in, so COBRA won't be an option. COBRA also doesn't apply to small businesses, although many states have what's known as "mini-COBRA" laws. Pollitz says your next option should be to check out public programs. Medicaid is the federal-state health insurance program for the poor. Generally, adults have to be very poor, with virtually no income or assets, to qualify in most states. But eligibility is much easier for children to enroll in the State Children's Health Insurance Program. In many states, families can have annual incomes of $40,000 or even $50,000 and still have their children qualify for state subsidized insurance. "I'm not so much worried about me right now. The kids to me are the most important," he says. But Secrest is already doing what Pollitz says is the next step for the laid-off — check out what's available in the individual health insurance market. He's lucky; because his job was sent overseas, he's eligible for financial help from the federal government through special trade laws. But it's still been a headache, he says. The only policy eligible for the subsidy will still cost "$500 to $600 a month," he says, "and I just can't swing that." Actually, premium costs frequently aren't the biggest problem people encounter in buying individual insurance policies — it's getting a policy in the first place, Pollitz says. "In most states, the individual market is medically underwritten, which means that you have to apply and disclose all kinds of information about your health status and your health history," she says. "And if you're even a little bit sick or you have even a little bit of a health history, you might have difficulty buying health insurance in the individual market. You might be turned down." Even if you do get coverage, it's likely to be much less comprehensive than the group coverage you're used to. "There may not be a drug benefit, or it may be capped at just a couple hundred dollars a year," Pollitz says. "There usually isn't maternity care. Often there's limited or no coverage for mental health care, for rehabilitation, for a lot of benefits that you would need if you got seriously sick or injured." One key thing: If you are laid off, make sure that before you go, your employer gives you a piece of paper known as a "certificate of creditable coverage." It helps guarantee that when you do get new health insurance — assuming you don't have a lapse of more than 63 days — you won't have to wait for coverage of a pre-existing condition.